I moderate an online critique group, the Christian Writers Circle, on Scribophile. Certainly, it is not a ministry outlet I expected when I left the private sector to work in ministry. As it turns out, God has had a different plan for ministry than I personally had envisioned. Today, I recognize that for me, writing is ministry, just as much as being a worship musician is. 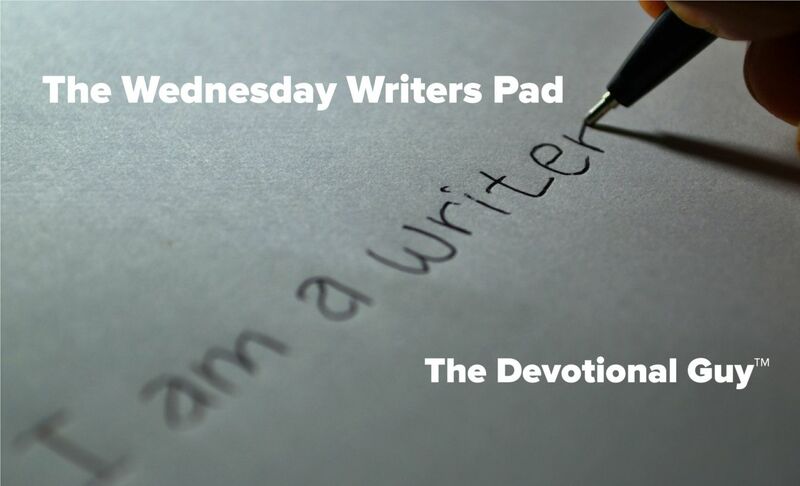 Part of my writing ministry is this blog, The Devotional Guy. Since launching it at the end of 2013, I’ve seen the blog grow, albeit slowly. Ministry isn’t quick. Often, individuals minister without fully seeing the fruit of their efforts. Noah built an ark. None of his neighbors appear to have been converted by his monumental exercise in faith. Jeremiah, the Old Testament prophet, not only didn’t have any converts, he made people angry by preaching the truth. They wanted to silence him in a very permanent way (if you know what I mean). Yet, he wrote prolifically and so his voice continues to be heard in the generations that came long after his. The results of God at work aren’t always as clear and obvious as people (like me) want them to be. Yet, we press on faithfully. You may have recently decided to use your writing talent to share the Gospel, to inspire people, and to do good things for the advancement of the Kingdom. You quickly learn that writing is often a solitary endeavor. Know that you are never alone. There are others–you just have to find and seek them out–who share your passion for blogging and writing to inspire. This past week, rummaging through the clearance shelves at my local Half-Price Books, I ran across the book “Writing to Inspire.” It looks like an old book. The print is reminiscent of the early word processor fonts that we thought were so impressive when they first hit the scene. Yes, kids, word processors were considered advanced technology once upon a time. Crazy. The cover is faded and slightly tattered. Published in 1982. Yikes! I feel as old as the book looks now. “Writing to Inspire” is an anthology edited by William Gentz featuring articles written by several faith writers of a generation past. In the 1980s, the religious market for writing was exploding. The book offers insights on how to get published and find niche markets geared for Christian writers. Several of the articles offer insights into writing better and producing marketable, readable stories, poems, articles and scripts for Christian television and film. It’s a good book highlighting an expansive subject. Knowing that others came before us helps us. The Bible, supernaturally inspired by God, is written by human hands. Jeremiah had a friend, Baruch, who served as his scribe and is believed to have helped Jeremiah with writing the books of Jeremiah, Lamentations, and the Book of Kings (1 Kings and 2 Kings). 2 Timothy 3:16-17(NIV) All Scripture is God-breathed and is useful for teaching, rebuking, correcting and training in righteousness, so that the servant of God may be thoroughly equipped for every good work. So, you see, writing has played a significant role throughout the history of faith and has proven to be an instrumental ministry to believers through the ages. Blogging is simply a digital form of writing, that can be used to advance God’s kingdom and bring Him praise and glory in the process. Do not be discouraged my faith-writing friend; God promises us that He is with us wherever we go. The world needs to hear your voice. Images courtesy of the fine artists at Pixabay. My friend, that’s the best part… 20 years later someone comes up to you and says, “Man, what you said (or wrote) changed my life.” That’s happened to me a couple of times and it’s like heaven on earth. To matter is a great feeling. Keep it up!